There’s nothing like the first feeling of fall. Crisp, cool mornings replace the refreshing chill at the end of summer. The golden-hued trees awe passersby. Sweaters and scarves make more appearances as fog and rain descend on our days. One of my favorite fall treats is the start of seasonal decorating! I love that with a few simple additions, autumn can cozy up the home, even as it turns brisk outside. Many of these items can be purchased on a budget and even saved to use year after year. Found at Farmer’s Markets, Grocery stores and the ever-delightful local pumpkin patch, these fall vegetables turned decor that can be used for so much more than just carving. Arrange on porches, benches or rocking chairs for a simple, festive look. 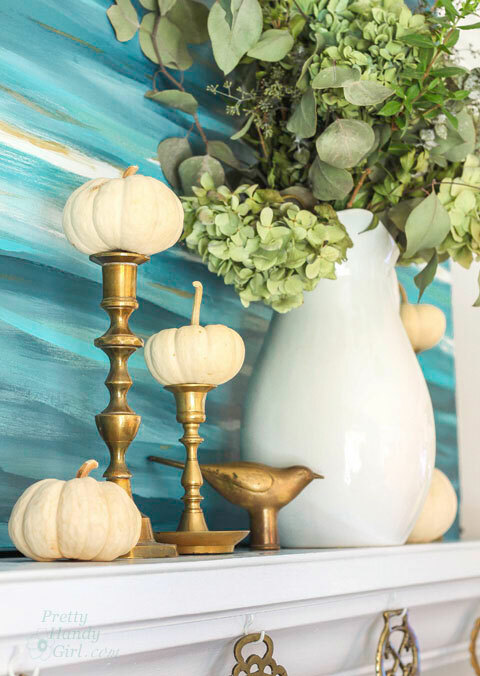 You could even top gold candle sticks with white pumpkins for a twist on table decor! Bonus if you pick out ones with lots of bumps and an extra curvy stem for character! Large or small, these whimsical throwbacks to fall bring character to a porch or a potted plant and can be used year after year. Gather these from your yard or on your morning walk. You can throw pinecones into a vase and have a simple centerpiece; a stick hung horizontally with leaves hanging vertically on twine makes an interesting display above a side board, entry table or even a mantle! You can use real leaves or make your own. See what I mean here. After a fall storm, you can even gather fallen twigs and spray paint them gold to use them as eye catching fillers wherever you please! Wheat stalks in vases by themselves look wonderful and very farmhouse chic. Add colored corn stalks to the porch or tablescape for some texture and naturalistic features brought indoors. There are a whole slew of autumn flowers that can be used in vases or as harvest gardens on your front porch or in a pot indoors. Add pops of color with mums, sunflowers and helenium, while using purple cabbage, hydrangea and honey-colored amaranth to balance it out. Throw in a scarecrow or an owl, if you please! Nothing says warm and cozy quite like an open flame, whether simply a candle or a roaring fire inside a mantled fireplace. I love the feel of a wood stove crackling alongside a good book and a cup of something hot. Not all decor elements are about objects, sometimes they are just about the feelings they evoke. You really can’t go wrong with the signature colors of fall. Be it a plaid blanket thrown over the arm of a rocking chair, a vase of flowers coordinated just so, or a shelf of treasured trinkets in these shades, it’s really just a throwback to the original, essential pallet of one of the best seasons of the year! A tablescape of white pumpkins, gourds and shed antlers brings a rustic, almost primal feel to time-honored setting. See an example here. Decor is about what the space feels like, and sometimes invoking memories or creating memories through scent is one of the strongest assets we have! Fill your home with the scents of the season and your guests are sure to remember their visit with fondness whenever they smell something similar. See recipes here and here for inspiration. Throw an elegant twist on an old favorite by locating or styling pumpkins, pinecones, gourds or squash in these accent colors for an eye catching centerpiece or display. Alternate with orange, yellow or red for a unique presentation. See inspiration here, here and here. Use burlap and twine as grounding elements in your fall decor. Twist around pumpkins, vases, sticks or as a burlap table runner for a fantastic harvest dinner. Mix and match these design elements to your heart’s content for heart-warming fall decor to make your home a cozy autumn haven! What is your favorite fall decorating idea?